I thought it was a game of Twister. 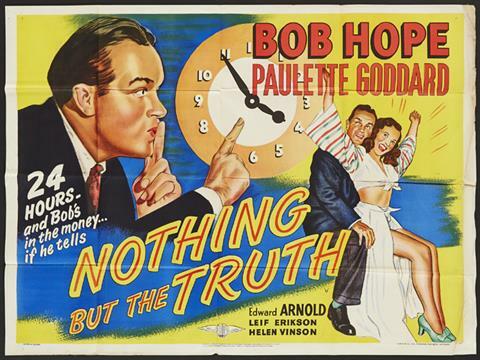 Nothing But the Truth (1941) - Amusing comedy from Paramount Pictures and director Elliott Nugent. Bob Hope stars as Steve Bennett, an investment banker in Miami. He agrees to hold on to $10,000 belonging to his boss's niece Gwen (Paulette Goddard), only to secretly use it all on a bet with his boss (Edward Arnold): Steve has to tell nothing but the truth for 24 hours, and he'll double his money. This leads to many embarrassing situations. Also featuring Leif Erickson, Helen Vinson, Willie Best, Glenn Anders, Grant Mitchell, Catherine Doucet, Rose Hobart, Clarence Kolb, Mary Forbes, and Leon Belasco. I watched MRS. SOFFEL, a 1984 film starring Diane Keaton as the wife of a prison warden who falls for a condemned killer (Mel Gibson) who, along with his brother, is due to be hanged, but she helps them plan and execute a daring escape. I heard it was based on a true story, but like all films supposedly based on a true story, no doubt some liberties were taken. Still, Keaton and Gibson make the story very compelling to watch....they certainly heat up the screen. Too bad they didn't make another movie together (one with a happier outcome). I always thought Keaton had more chemistry with Gibson than she ever did with Warren Beatty in REDS or Jack Nicholson in SOMETHING'S GOTTA GIVE (though for pure 100 percent electricity nothing beats the confrontational scene she has with Al Pacino's Michael Corleone before Kay leaves him). 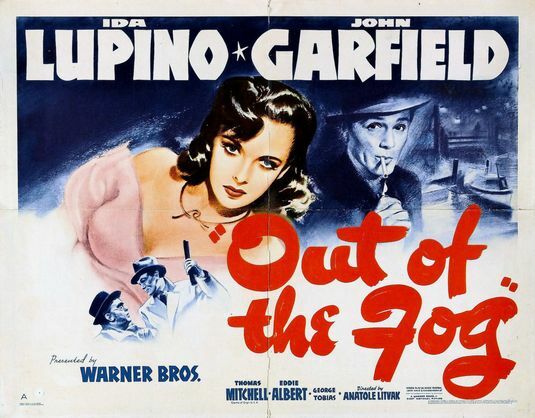 Out of the Fog (1941) - Atmospheric crime drama from Warner Brothers and director Anatole Litvak. Harold Goff (John Garfield) is an amiable hood who runs a brutal protection racket on the poor dockside neighborhood denizens. His latest target is old man Jonah Goodwin (Thomas Mitchell) who, along with slow-witted pal Olaf (John Qualen), has been saving money to move to the Caribbean. Now it looks like his dreams may be dashed as Goff is intent on taking every last dime Jonah has, as well as dating Jonah's daughter Stella (Ida Lupino). Also featuring Eddie Albert, Aline MacMahon, Leo Gorcey, George Tobias, Jerome Cowan, Odette Myrtil, Robert Homans, Bernard Gorcey, and Paul Harvey. Great write up! I found the Lupino character to be kind of misplaced. I would have liked the character to be either on the side of the hood (like she was in High Sierra), as part of an anti-establishment type of persona or more against what he was doing to those the 'good folks' that cared for her. Another Year (2016) [Lesley Manville won an Academy Award for Best Supporting Actress which seems richly deserved---error, she was not nominated] as she heads a cast of several others in this ensemble piece. Yes, another year; the film provides snapshots of the lives of a middle-aged couple, Tom and Jerri (Jim Broadbent and Ruth Sheen) in segments that are taken from a single day of each season of the year. The segments are so titled: Spring, Summer, Autumn, and Winter. Tom and Jerri's marriage is contented and in comparison with the rest of the cast (a son, a brother, and two family friends) fully functional as they serve as an anchoring presence, appearing in all four segments, providing support for the others, all who experience varying levels of trials and tribulations. Mary (Manville) is the most fully developed and is the true center of the film and is the only other player who appears in all four segments. Her plight borders on the edge of what might be termed maintaining above board and her portrayal is rendered with acute precision and poignancy. Lesley Manville simply put, dazzles. All the players exhibit a rich spontaneity that nearly makes one feel they are improvising, The result is a verismo effect that captivates. Some of these characters will fare better than others and some may affect us more deeply. If there is a culminating harshness, it is done without manipulation. The film does not have anything up its sleeve, it simply gives us, to coin a phrase, a slice of life---for better or for worse. Rage in Heaven (1941) - Psychological thriller from MGM and director W.S. Van Dyke. After a prolonged absence, Philip Monrell (Robert Montgomery) returns to England from abroad to discover that his mother (Lucile Watson) has a new secretary named Stella (Ingrid Bergman). He instantly falls in love with her, and they marry, but he soon starts to become insanely jealous, particularly of Stella's relationship with his friend Ward (George Sanders). Also featuring Oskar Homolka, Philip Merivale, Matthew Boulton, Aubrey Mather, Frederick Worlock, and Francis Compton. Good movie, but Manville did not win an Oscar, for that or any other movie, as yet. She wasn't even nominated for Another Year, although it did get a screenplay nomination. Remorques aka Stormy Waters (1941) - French romantic drama from screenwriter Jacques Prevert and director Jean Gremillon. Jean Gabin stars as Andre Laurent, a rescue tugboat captain living and working in a stormy seaside village. He's 10 years married to the pleasant Yvonne (Madeleine Renaud), but he's become a bit bored and complacent with their union. On his latest rescue outing, his crew brings aboard a woman from a stranded ship. Her name is Catherine (Michele Morgan), and she's very unhappy in her marriage with the other ship's captain, a sleazy crook that she has grown to detest. Despite their better judgement, Andre and Catherine begin seeing each other. Also featuring Fernand Ledoux, Charles Blavette, Jean Marchat, Nane Germon, Anne Laurens, Marcel Duhamel, and Henri Poupon. I agree wholeheartedly about Jean Gabin. He's my favorite French actor, too. Very natural acting style. Another for which I yearn ... I've just put it on my SAVE list with Netflix, but that could take forever. Jean Gabin is terrific, totally agree, and he's coming up next year (per your scheme) in Moontide, which I love. Ida Lupino is striking (beautiful) in that, and that natural style, Christine, of Monseiur Gabin is very evident there. I have a fairly extensive review of Moontide on my computer from years ago that I never posted but I think I'll leave it there. I'll wait for your review, Lawrence, and react to that. I'm afraid I won't be reviewing that one, as I've already seen Moontide. All of these that I discuss in these threads are first time watches, and I saw Moontide quite a ways back. I was a fan of it, and I recall liking Thomas Mitchell in it, as well as Gabin, Lupino, and Claude Rains. Last night on SVENGOOLIE I saw( again) THE 5,000 FINGERS OF DR. T.
First saw this on the "late show" back in the late '70's, a time in my life when I was living "a better life through chemistry "
But the effects still fascinate me, as well as the subject matter and design for the times in which it was made. And Sven let on about a few "secrets" I was unaware of. Like some disposed of "subversive" songs and scenes( which weren't explained as to HOW they were "subversive") and that DANNY KAYE and BING CROSBY were first considered for Dr. T and the plumber respectively. Now, I don't know about Bing in the plumber role, but as much of a KAYE fan I've long been I still don't think he'd have done better than HANS CONRIED as the twisted Dr. T. That character's type was a perfect fit for Conried's wheelhouse. I've GOT to get a DVD of this movie. And despite how much fun the mescaline made this film to watch, it's just as much fun when SOBER! Is Moontide the film about the bait salesman, with the very evil Thomas Mitchell; and all that Dali design? If so, I remember enjoying it very much. I Got Moontide a few years back on a DVD closing sale-- it has similar tone and Motif to Jean Gabin's French movies. But I mainly bought it just to see Ida, because she never gave a bad performance. However the shocking performance in this movie is Thomas Mitchell playing against type-- frankly it was a bit upsetting to see, but so good. With Jean Gabin's European reputation, Fox had hired a great European director for him, Fritz Lang. But that didn't work out so they got the reliable journeyman Workhorse Archie Mayo. Jean Gabin himself never clicked with the American audience-- so he just went back to France after the war and continued to be a legend in French and World Cinema. They Knew What They Wanted (1940) - Melodrama from RKO and director Garson Kanin. Tony (Charles Laughton) is a simple yet successful Italian immigrant who owns a large grape farm in California. After he sees beautiful waitress Amy (Carole Lombard) during a trip to the city, Tony falls hopelessly in love, and he enlists his best friend and foreman Joe (William Gargan) in composing love letters to Amy to convince her to marry Tony. They succeed, but when Tony sends a picture of Joe instead of himself to Amy, things get complicated, as she arrives already in love with the image of Joe to only be told that the real Tony is something altogether different. Also featuring Frank Fay, Harry Carey, Joseph E. Bernard, Lee Tung Foo, Marie Blake, Nestor Paiva, and Tom Ewell & Karl Malden in their screen debuts. I like the rather downbeat They Knew What They Wanted well enough, but have a problem with Laughton's performance. It's broad, as you say, Lawrence, with a pretty thick attempt at an Italian accent. But while we keep hearing references to the fact that his naive, salt-of-the-earth grape grower character is a great guy, what does he do that makes him so great? He's good natured, I know, and trusting but one could also make a case that he's a bit simple minded. Lombard's good as the lonely waitress (though she's awfully good looking to have no man in her life!) and any film that combines these two stars is definitely worth a look. But that scene in which Laughton is bouncing on the roof top with his, "Hey, Amy, looka me, looka me," had me thinking, "Fall already, ya big goof!" Stranger on the Third Floor (1940). I watched it because Nathanael West was an uncredited screenwriter, a fact that some guy named Muller, who introduced the film, did not mention (and then only fleetingly) until after the film. The movie was interesting, a few too many flashbacks for such a short film, but good atmosphere and good cast. Mr. Muller brought to mind two of my favorite movie lines: In response to his intro, I would quote Mae West's line to Harold Huber in Klondike Annie: "Can't you ever say anything the short way?" And I would bestow upon Muller the Mantan Moreland/King of the Zombies Award in the "Can I help it cause I'm loquacious?" category. 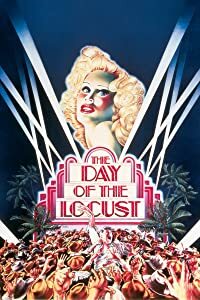 If TCM really wants to get into a serious study of film, they can screen a few of the West-scripted films alongside John Schlesinger's masterful 1975 filming of West's novel, The Day of the Locust, a movie which cries out to be shown on TCM more than any other. Of course, TCM can even go a step further and show My Sister Eileen alongside the aforementioned movies. Nathanael West was married to Eileen McKenney, whose sister Ruth wrote My Sister Eileen about her. On December 22, 1940, Nathanael and Eileen were killed in an automobile accident in California, just a few days before they were to leave for NYC, for the Broadway premiere of the play My Sister Eileen, which opened the day after Christmas that year. Btw, Ruth McKenney's daughter Eileen -- named for her aunt -- was a long-time New York State Supreme Court judge. Road Show (1941) - Musical comedy from United Artists and producer-director Hal Roach. When wealthy Drogo Gaines (John Hubbard) learns that his fiancee is only after his money, he tries to call the wedding off. However, her family helps to have Drogo committed to an asylum to get him out of the way. He later escapes with the help of fellow eccentric patient Col. Carroway (Adolphe Menjou), and the two hide out in a rundown traveling carnival run by Penguin Moore (Carole Landis). Also featuring Patsy Kelly, Willie Best, George E. Stone, Margaret Roach, Polly Ann Young, Edward Norris, Florence Bates, Shemp Howard, and Charles Butterworth. William Gargan earned an Oscar nomination for Best Supporting Actor, although his role is really a lead, and he even has more screentime than Laughton. Gargan is good, but not in a flashy way, and his role is one that seems like an odd choice for a nomination. It may have been a career acknowledgment, as he'd been a popular B-level leading man since the late 1920's. He was the real deal, too, when it came to tough guy roles, as he'd been both a bootlegger and a detective before he started in pictures. *A few years back, I watched William Gargan as Martin Kane on a PBS TV revival series. The United States Tobacco Company was the sponsor and Gargan did several live commercials during the show with all kinds of tobacco products. Plus the character Martin Kane smoked a pipe, which was prominently featured as pipe tobacco was one of those sponsored products. Gargan was one of the first Hollywood celebrities to lend his name to the fight against cancer, after he lost his larnax to the disease. Replacing Gargan was actor Lloyd Nolan--playing the part and doing the live tobacco commercials. Nolan, also an avid pipe smoker, died of lung cancer although he lived to be 83, dying of cancer in 1985. 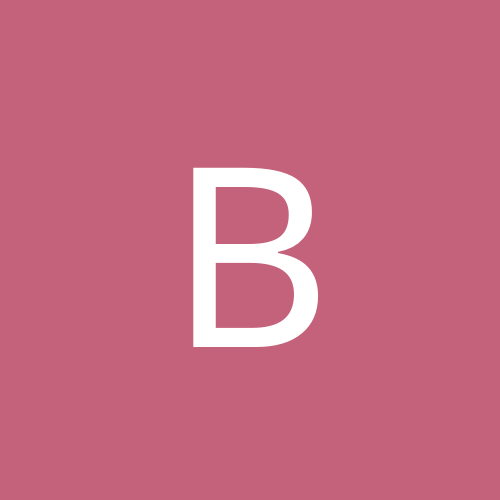 The PBS preceded the showing of the old TV series with a warning about the tobacco commercials and an explanation that the commercials were integral part of the show. Yeah, I'd like to see Sextette. Oh, you were still referring to Nathanael West, not Mae. Nathanael West was married to Eileen McKenney, whose sister Ruth wrote My Sister Eileen about her. On December 22, 1940, Nathanael and Eileen were killed in an automobile accident in California, just a few days before they were to leave for NYC, for the Broadway premiere of the play My Sister Eileen, which opened the day after Christmas that year. They were on their way to F. Scott Fitzgerald's funeral when they got in that accident, weren't they? I don't know -- they were returning from a hunting trip to Mexico, I think. Fitzgerald died December 21; West died on December 22.